Populations have been living around Lake Titicaca for 10,000 years, dating back to the Archaic period. The first communities appeared around Titicaca in 1,200 BC and since then have increased in population and have become more dependent on its water for their livelihood for agriculture and navigation. Titicaca, the world's highest navigable lake, which straddles the border between Bolivia and Peru, is a place venerated by the ancient Incas who ruled throughout South America from the 13th to the mid-16th centuries. Living beside such a large body of water, people sometimes take for granted the effects pollution can have. on the shoreline of Lake Titicaca. Lake Titicaca region experiences a high variability in terms of its weather patterns. There is a high level of uncertainty, and risk, living under such conditions. The lack of sewage treatment plants around the lake causes most waste to be put directly into Titicaca and, as a result, pollution levels have been rising over the decades, thereby contaminating water. In June 2006, a health ministry-appointed committee of experts sent to the area of Cohana, (Bolivia - a breathtaking 3,800 meters (12,500 feet) above sea level) found "the potential presence of pathogens such as bacteria, viruses or parasites" in the bay, making it the most polluted sector in Titicaca. "Biological activity is directly affected by the water's lack of oxygen: fish that generally were everywhere now are dead," one study said. Other sources of degradation come from the cattle industry that surrounds the lake and the loss of soil due to their impact and, with regards to the fishing industry, the introduction of exotic species and the overfishing of both those and indigenous species has left the lake with smaller and smaller fish. In the rainy seasons of 1982-3 and 1989-90, extreme droughts caused hundreds of millions of dollars in damage to the agricultural industry, both crop and animal. The years in between experienced a higher than average rainfall and culminated in the severe floods of 1986-7 causing, again, over a hundred million dollars of damage to not only the agricultural industry, but to infrastructure as well. The stress under which the people live does not create an environment conducive to awareness regarding pollution and sustainability. The two nations, Bolivia and Peru, have had negative economic growth rates over the last 10 years. More than 30 thousand informal unregistered small scale mining operations near the world’s highest navigable lake are causing terrible pollution to both it and surrounding rivers. Lake Titicaca possesses the continent’s largest source of fresh water, and its preservation and protection are likely to be vital for the future of the region. The increases in the lake’s levels of pollution are alarming. 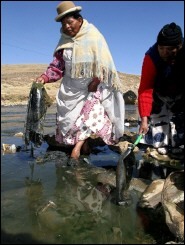 Among the many towns living off Lake Titicaca, Pajchiri Bay is the most polluted with contaminated water, fish and plants. Officials in both Peru and Bolivia have agreed to work together to clean up the contamination of the bay after a recent investigation of the waters. For the second straight week (6th April, 2009) Lake Titicaca (Puno Peru) took the No. 1 spot in Group F of the New Seven Wonders of Nature campaign, according to the latest ranking of contest organizer, the New 7 Wonders Foundation. With this world rating, let’s hope it gives the Lake’s two custodians, Peru and Bolivia, the incentive to continue to work together and restore one of Natures natural wonders. See also: Peru, Bolivia to clean Lake Titicaca of 22 Nov 08, 30,000 illegal mines pollute Lake Titicaca of 22 Sep 08, Case Study Transboundary Dispute Resolution: Lake Titicaca (pdf, 102K), Peru: Lake Titicaca leads new seven wonders contest of 6 Apr 09, Bolivia's Lake Titicaca strangled" of 3 Aug 07. This disaster, an ongoing one too, is such a tragedy... Ironic being that the Incan civilization pioneered the idea of sewerage pipes and systems, way before their European conquistadors had such systems back home. I find it so disgusting too that so many Aussies and the like visit Lake Titicaca, and not because they do visit it, but because I wonder whether they notice the pollution and secondly, whether if they do, they fear the notion of the reality might poison their mirage of Peru and their holiday. The entire place is quite peaceful and overwhelmingly quiet. The inhabitants of Titicaca lake are mostly the ancient people of Peru. There are lots of places and items that show the history of the people around the lake. The people around the lake still live an over whelming traditional way of life. Editorial comment: This comment appears to be, in part, an advertisement for a travel company. It is, however, related, if only in a loose sense, to the article.